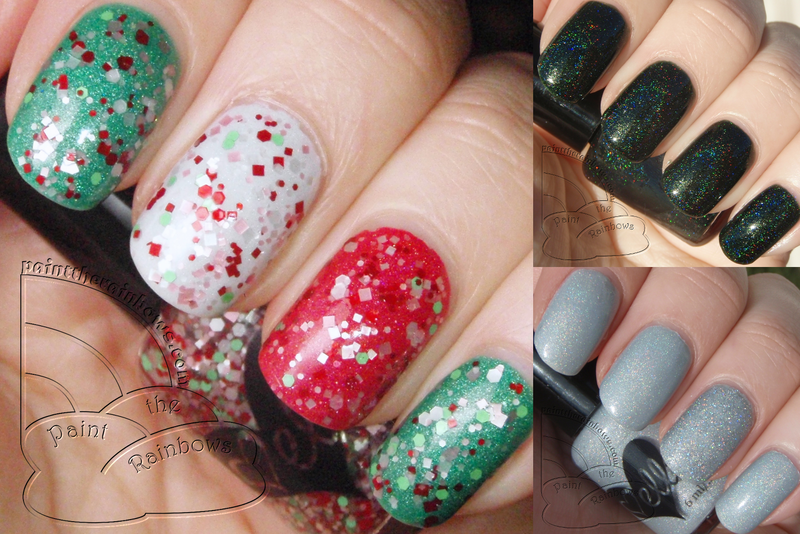 And I will start by showing off a few lovely holiday polishes from Ellagee! Ellagee is a brand I have been following for awhile, so I was thrilled when Laura, the creator behind these pretty polishes, contacted me about reviewing a few for you guys. And bonus, they are all Christmassy, AND two are holos - score! It's A Festivus Miracle! is a very pale grayish blue with a subtle scatter holo. I love this color! So delicate and super wintry. I had no trouble with the formula, it was excellent. To jazz it up a bit I did a tiny accent of Saran-wrap marbling with China Glaze Glistening Snow. Loved these two together! 3 coats Ellagee It's a Festivus Miracle! Overall I was totally thrilled with these polishes from Ellagee. Not only were the colors beautiful and the application great, I just really loved how they all were so different and unique, but each able to get me in that special Christmassy mood :) Love love love Christmas nails - look forward to more soon! isn't is so pretty and festive? I love this picture! Merry Christmas!! Your nails are so festive. I have missed your posts. Gorgeous colors! I Wish You Peace is amazing, I love it.